For better or worse (often for worse), I am an idea person. Not really in an inspiring, visionary type of way. More in a “Hey, I have an idea! I’m going to glue Japanese candy wrappers to a piece of cardboard and frame it!” kind of way. I’m less Steve Jobs, more lady on Hoarders who saves empty yogurt containers to make Christmas ornaments. I have ideas! Lots of ideas! For a while, I wanted to start a second blog, for desserts, called Oh My Pants. But then I realized that the fact that I don’t bake much might get in the way and really, I just wanted a blog called Oh My Pants. So then I came up with another idea. I’d start a blog called Oh My House. We’d buy a house (bonus points if it was a former crack house or brothel–hello, interesting backstory! ), renovate it, decorate it, and blog about it. Oh sure, the domain might have been taken, but I had the house picked out and everything! Except that there are eleventy billion home reno blogs out there right now. And we can’t buy a new house 2 years after moving into this one. Also, my idea of decorating is gluing Japanese candy wrappers to a piece of cardboard and framing it. Oh My House just wasn’t meant to be. New ideas are great, but sometimes it’s best to stick with what you know, right? Like sweet potatoes and black beans. Is it the most mind-blowingly innovative ingredient combination ever? No! But it’s delicious, healthy, and filling. 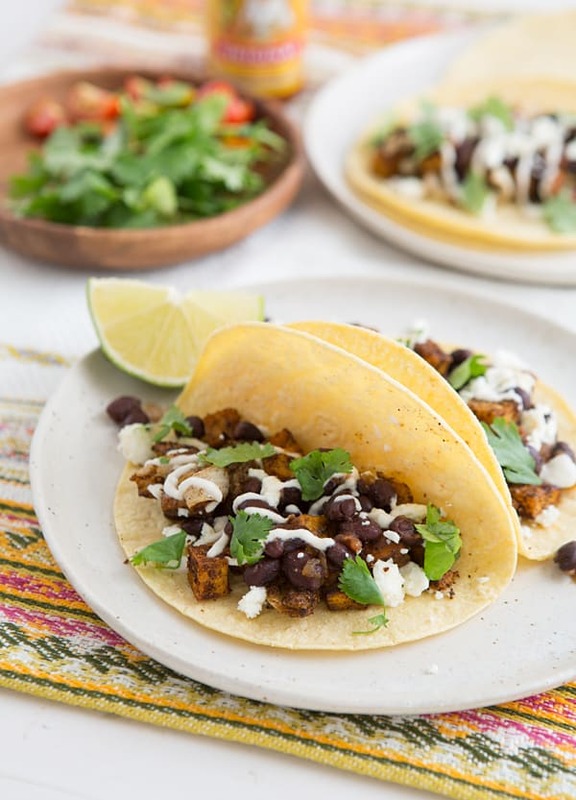 These Roasted Sweet Potato & Black Bean Tacos are one of those classic vegetarian recipes that you really can’t go wrong with. After tossing sweet potato cubes and onion wedges with a little olive oil, lime juice, and spices, you roast them in the oven for 25 minutes; while they’re roasting, you simmer some black beans with salsa. Put them together on a tortilla, top them with delicious taco things like crumbled queso fresco and cilantro, and then get excited because dinner is done! 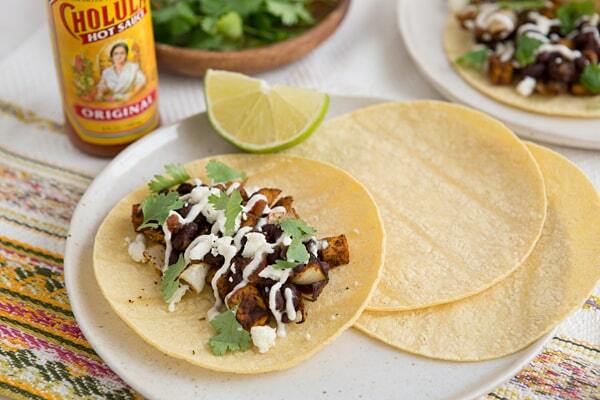 Vegetarian tacos filled with black beans and roasted sweet potatoes. 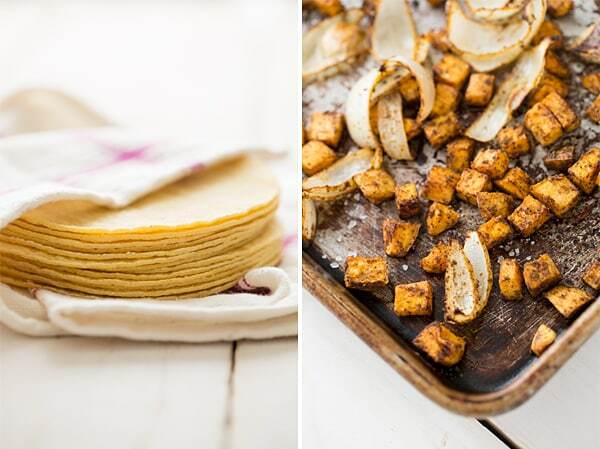 Toss the sweet potato cubes, onion wedges, olive oil, lime juice, cumin, chili powder, cayenne pepper, and salt in a bowl. Transfer to a rimmed baking sheet and bake for about 25 minutes, or until potatoes are tender, stirring halfway through cooking time. Fill each taco with salsa beans and sweet potatoes, then finish with desired toppings and a squeeze of lime juice. Also, I can’t wait to try these tacos. Delish! I’m always bouncing around ideas and running with new ones…and then realizing how busy my life is as a result! Lately, this has meant a ton of undocumented recipe play in the kitchen and revisiting old staples. A sweet potato – black bean combo has always been a favorite of mine. haha lady! you are hilarious! i want to renovate an old, run down house, too! dayv thinks i’m crazy. i love black bean and sweet potato tacos. must make these! Oh yeah, Chris thinks I am NUTS. I found the house I want and every morning, I look at pictures of it on realtor.com. That’s not creepy, right? It’s a mid-century modern ranch that’s been on the market since 2012 and keeps dropping in price. You should see what it looks like inside–just terrible! But I am obsessed with it. You are so funny, but this wrap is not. looks so yummy, healthy and good. You are right though, we come up with an idea, thinking, wow Genius and google it up and there are millions of stuff like that…but hey, they were your ideas too.:). OH MY TACOS!!! Dude, these are going to happen in this kitchen! I can *almost* taste ’em… holy mother… SO GOOD!! I am the same way with ideas, I’ve got them, I’m just not good at executing them very well! Oh, and these tacos look awesome. I love anything with sweet potatoes and black beans! i love your ideas. i can’t wait to try this. i think it should be called oh my yum! I love the sweet potato and black bean combo, especially in taco form! I was just looking through my cookbooks for recipe ideas and was considering making something with a sweet potato, black bean and tomato combination! I like your idea of heating the black beans with salsa instead of actual tomatoes for a tasty taco filling…and I’m sure the filling would be good just as a salad too! Yes, this would make an awesome taco salad! I so want you to have a blog by the name of “Oh My Pants.” Coolest name ever! These tacos are pretty awesome. I’m known around these parts for over indulging in tacos. Lovely healthy and yummy wrap..
dude, you definitely need to start Oh My Pants! I’ll happily be a contributor 🙂 Who needs healthy?!? I have too many ideas. Don’t encourage me! Because I’ll do it! Woah, hello tasty! I totally want these snackadoos in my face right now. Great photos and love the tacos. I’m a vegetarian and adore sweet potatoes; my husband is a carnivore and “doesn’t dislike” sweet potatoes. We both LOVED these tacos! Thanks for the creative idea. Yay, I’m so glad you both enjoyed them! 🙂 Thanks for your comment! I made these last night – seasoned for me and the husband, plain for my unspicy pre-schooler son. Everyone LOVED them – thank you so much. These will be regular additions to our dinnertimes! I made these and they are delicious!! Do you have nutritional information for this recipe? I’m glad you enjoyed them! I’m sorry, I don’t calculate nutritional information for my recipes. I made a couple modifications based on what was in my pantry, but you can figure out the nutrition here: http://caloriecount.about.com/cc/recipe_analysis.php. It’s my go-to for scratch recipes! Oh My Yum! Made these last night and they were a hit! We didn’t have any leftovers 🙁 I added a little soyrizo to the beans too. Trying the Cilantro Pesto Pasta tonight! Can’t wait to get out of this cubicle and go home to start cooking. Thanks for the inspiration! You out did yourself here. These tacos were yummylious! I seriously was just planning on having two and then I tasted them. Oh my goodness! The best tacos ever. I ended up having 4. They’re small right. After I made them, I couldn’t help sharing the link to the recipe with others. My husband who is not a veggie or a black bean fan will LOVE these still. Thanks for the good work! You have a huge following. These tacos are just one reason why? Anyway, super excited for lunch tomorrow. Thank you! Yeah, I can see how tacos wouldn’t be appetizing when you have the flu! 🙂 But I’m happy to hear you liked the recipe! I substituted coriander for the cumin, used feta for the cheese, and made some lime-marinated red onion to add to the tacos. Absolutely delicious! Thanks for the recipe!! Another winner – everything I’ve made from OMV has been so good! This was one of the first vegetarian blogs I found and started following after becoming vegetarian two years ago, and it has been such a great resource. Just made them and they were amazing! !